1999 Plymouth Voyager or Dodge Caravan headliner repair and installation. 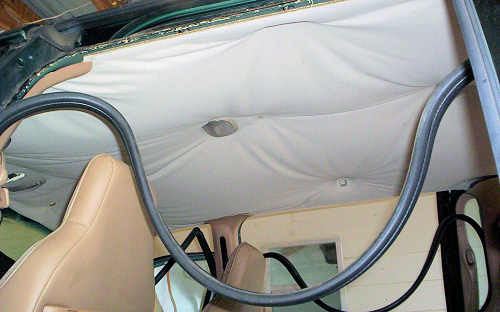 This 1999 Plymouth Grand Voyager has a serious sagging headliner problem - not a problem to fix if you have a little time. It took about 2 hours to remove, recover and replace the headliner in this Grand Voyager - with an unexperienced new employee. The complication factor for the 99 Grand Voyager headliner replacement is low. 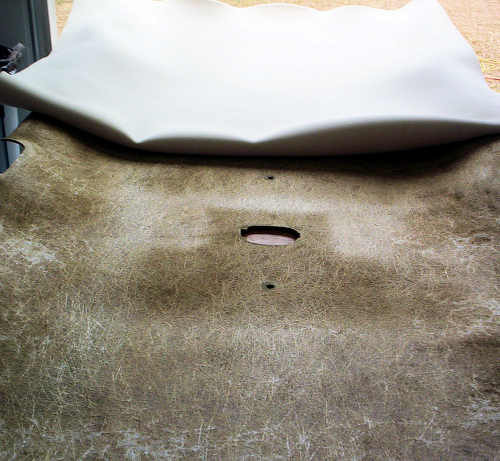 The color we used for this Plymouth Grand Voyager headliner was 2037 lt neutral. 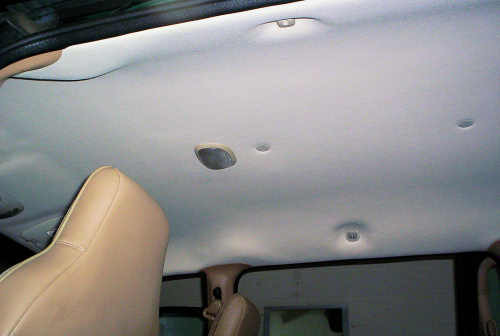 The grand and large minivan headliner kit is what we used for this Grand Voyager headliner [comes with 2 adhesives]. As you can see from this picture, the complete headliner had fallen and was being held up by the dome lights, visors and anything else that attached through the headliner board itself. The first thing to do is remove the sunvisors and hangers that support them, and then pull the rubber door trim loose. This trim hides the edge of the headliner board [trims it off]. There were very few screws that held the Grand Voyager in place, the front, middle and rear side panels were clipped into place with metal clips. We didn't remove the side panels to remove the headliner, we only unclipped one or two of the top clips so we could slide the headliner board out from under the trim panels. This is a picture of the windshield post trim (at the front of the minivan). The clip can be seen as well as the line up stud. 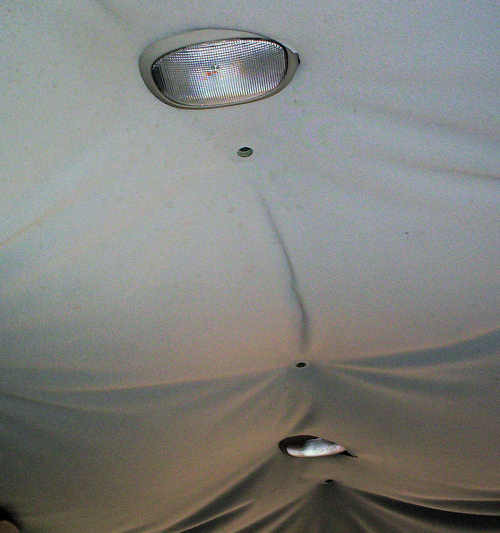 There were 3 interior lights in this Grand Voyager, this is a pic of the front dome light. It can be removed by pulling or prying down on it - it is secured with 4 metal clips to the body of the minivan. Once it is removed, the electrical connecter can be unplugged. 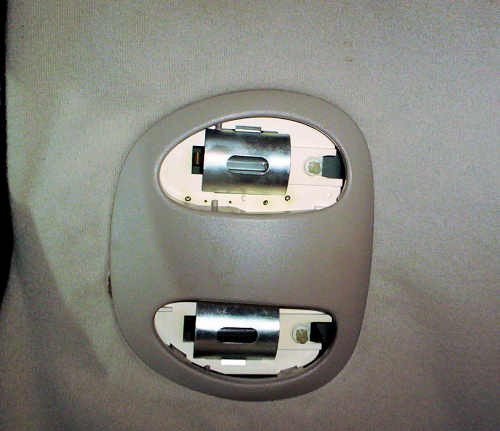 The other 2 dome lights in the 99 Grand Voyager (rear dome lights) can be removed by unsnapping the lens to free one side and then sliding the dome light to the right in this case to remove it. Once it's removed the electrical connecter can be unplugged. 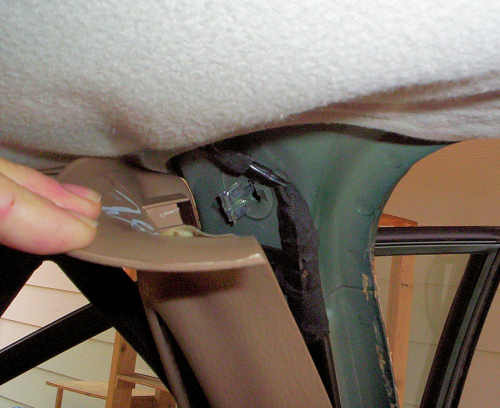 The rear seat belt bracket in this Grand Voyager needs to be removed so the rear trim panel can be loosened. 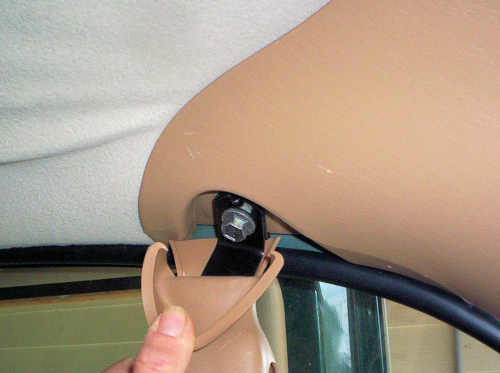 There is a bolt that secures the seat belt bracket, once it's removed the side trim panel can be loosened to the point the headliner board can be slide forward to fall free. As stated before, all the rubber door trim should be pulled down to expose the edge of the headliner board. 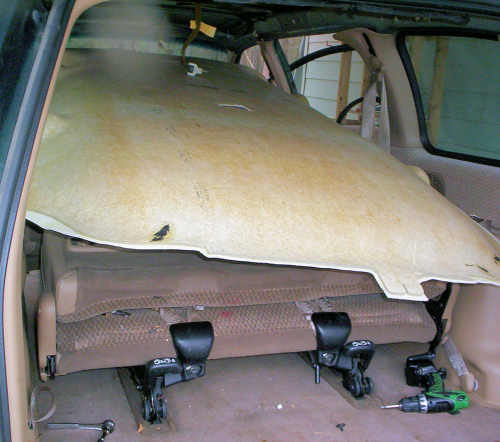 When the headliner board has been freed from everything that holds in place, it can be removed out the back gate of the Grand Voyager minivan. To clean the board, you can use a standard grill brush (wire brush) to scrape all the old foam off. 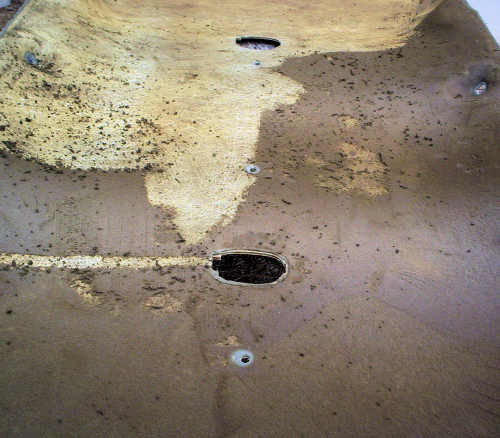 The glue does not need to be removed, just the old deteriorated foam and the dust it creates. Get the board as clean as you can so the new material will adhere properly. Fit the new headliner material to the board, making sure there is plenty of over hang in the front and back, fold it back about half way and start applying the adhesive to the headliner board and the new headliner fabric. 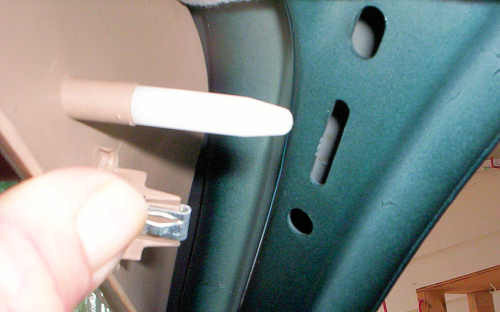 Apply the new material by "rubbing it out" good with your hands (palm and fingers outstretched flat). If you have any deep indentions in the headliner board, work the headliner material into the indention first; and then around it. Give it a little time to set up and slide it back into the minivan, replace everything just like it came out and you will be good to go. If everything is done properly, you should have a finished job that looks like this - or like it did when you bought your vehicle. The headliner color we used for the 1999 Plymouth Grand Voyager is 2037 lt neutral. The grand and large minivan headliner kit is what we used for this Grand Voyager headliner [comes with 2 adhesives]. From 3 to 3.5 yards of material, depending whether you have the standard version or extended version minivan. approximately how many feet of the headliner material is needed to cover the whole ceiling? thanks! Anyone figure out how to remove the rear AC/Heater control module without damaging it? Headliner material consists of a foam/material combination, so; you would replace both at the same time. Do you have to replace the foam or is that not necessary? I have a 98 Dodge Grand Caravan and it has the rear a/c switch as well as the overhead console. Still trying to figure out how to remove them. We use the 3M headliner spray adhesive. What sort of adhesive did you use? Good job on this. I am still working on the deeper curves for the coat hooks. Don't see how to get all the material into these indentations without wrinkling the fabric somewhere, anywhere outside of the indentations. You would need to make the cuts yourself, headliner material is very stretchy and could not be precut. Regarding the dome lights, visors and anything else that attached through the headliner board itself, did the new headliner have holes pre-cut, or did you have to make new holes manually? Great information on replacing the headliner in a Voyager minivan. Thanx for the info.